A flight in the Citation X+ gave one pilot the chance to see the world as few ever have. There are few sights from the air that most pilots—indeed, most people, at least those in developed countries—haven’t seen. If you've flown in an airliner on a long trip, you’ve been lucky enough to witness things that those who never flew, pretty much everyone in the history of world who died before the mid-1950s, never saw, like the expanse of ocean stretching out below us, nothing but blue behind and before us, limitless, or the rise of great mountain chains, Rockies, Alps or Urals, flattening with altitude as we traverse them from above. But there’s one sight that very few have had the chance to see firsthand: the curvature of the earth. The earth is round, or perhaps it’s more technically accurate to say that it’s an oblate spheroid, though from space it just looks like a big blue ball. From the ground, it just seems flat, which is perhaps why flat-earthers insist that it really is. To prove our planet’s shape to them, we’d need only take them to the shore and let them watch a ship as it disappears over the horizon. But we can’t see the actual curvature of the horizon because of relative size. We are very small compared to the earth, so it seems flat to us, a concept known as local flatness. A commonly used example of this phenomenon is a flea on top of a basketball. We’re so big we can easily see the ball is round. The flea is certain it’s flat. But if you get that flea a big ladder, it would easily be able to see the basketball was round. Why this is so is a remarkably complex subject that involves the apparent lens optical length and width, as well as the field of view you have available. 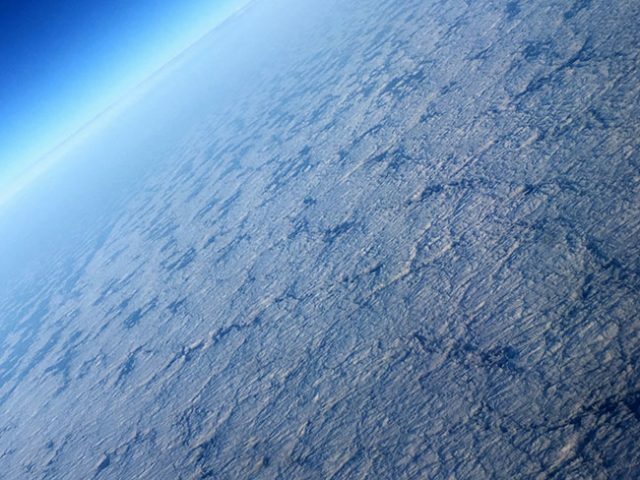 But suffice it to say that the curvature of the earth is slightly visible at airliner altitudes but quite clearly visible from 10,000 feet higher. At 51,000 feet, the highest ceiling of any production airplane, it’s quite easy to see, especially if you’re in the pilot’s seat and are afforded a field of view of 300 degrees or so. I never had the chance (or the dough) to fly on Concorde, and the jets I’d been able to fly for various reports were all maxed out at between 40,000 and 45,000 feet—that is, until I got the chance in close succession to fly a trio of planes that could go all the way to 51,000 feet. They were the Dassault Falcon 900LX, the Cessna Citation X+, and the Gulfstream G650, the latter two of which I flew to FL 510. The first time I did it was in the Citation X+ a few years ago. How was it? Was the view different? It was, and not only that, but the entire experience was different. The experience of cruising along at 51,000 and seeing the earth visibly curved and farther below than I’d ever seen it before gave me a taste of what it might be like to be in space. I know it’s only about halfway there, but I still got that sense. I’ll be honest. Just thinking back on it again has me spellbound once more. There I was, high over Kansas, with the horizon more than 270 miles ahead, this compared to a horizon just 85 miles ahead at a common small plane altitude of 5,000 feet. It’s a different world below from there. I shouldn’t have been surprised by the feeling. After all, early NASA pilots who flew up toward space in rocketplanes described the same sensation, that flying that high gave them a perspective on our planet and ourselves that changed their outlook on life forever. And so it was for me. I can’t help being the stinker here, but what? Gasp, shock, and horror, the Earth is round? I got to see first hand on a flight from SoCal to NorCal. I believe the flight was from Long Beach to San Jose, in the late 80’s. The pilot announced that the curvature could be seen. I looked to the left and I could see an ever so slight curve in the Pacific and to the right it was total darkness. I was so excited, I was afraid to move.